Migrants arriving in Tijuana from the Central American caravan are being met with hostility by locals who are afraid of troubles they bring with them. This fear comes from Social Media and from people like President Trump who have spoken badly about them. But Mexican officials say that only 34 arrests have been made so far from the estimated 2,500 migrants that have arrived. Those people arrested were charged with minor offenses in Mexico, like drug possession, public drinking and petty theft. Most of the immigrants are from Honduras and most are seeking asylum in the United States, but at the San Diego crossing only processes about 100 applications a day. This means it could take up to six months for people seeking asylum to be processed and it is believed that a majority, if not all of them will be denied asylum. Officials in Tijuana have set up makeshift shelters at a sports arena, and at this time the migrants are staying within a three block radius of the stadium. 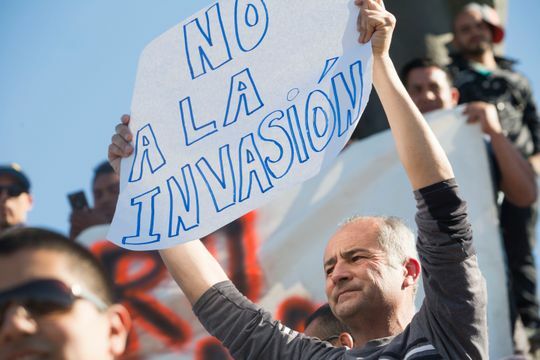 However, many more are expected to arrive soon raising concerns among the residents of Tijuana. Last year 3,000 Haitians entered Tijuana seeking asylum in the United States, but all of them were denied. The Mexican officials said the Haitians were orderly, didn’t ask for anything, made their own food, rented apartments and started assimilating into the Mexican society. The Haitians were offered Mexican residency and most accepted. Many from the Central American caravan, however, are rowdy and have refused the idea of Mexican residency. They are determined to cross the border into America. It is estimated that the total amount of migrants in the caravan is between 6,000 and 7,000. Those who have arrived are unwanted by many local residents and are a burden on the local economy. While Mexico refused to pay for Trump’s wall, it seems they are paying in a different way.